Tags: Nicky Palma, poker scam, poker staking, Tim Reilly. Posted on Tuesday, August 07, 2018 by "T". Back in June, we reported this story about Nicky Palma. If you have a poker debt to someone, make sure to pay it off or risk public shame. 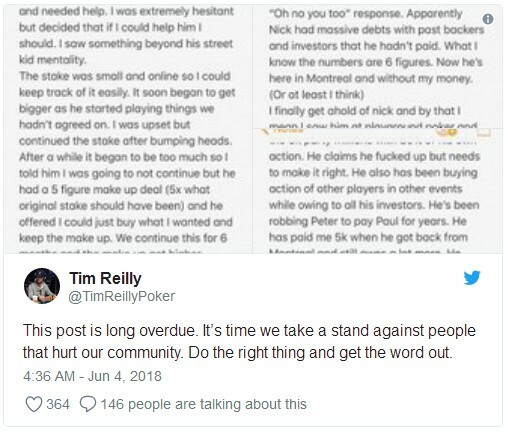 In the case of Nick Palma, he learned it the hard way after fellow poker pro Tim Reilly bared it all out on Twitter, accusing Palma of refusing to pay off his debts that came from their backing deal. This is actually a normal thing in the world of poker, the backing part, that is. Investor gives a poker player (with a dubious track record of bankroll management) a significant amount of money so that he can enter tournaments, and then the next thing you know, investor claims he has been scammed. Tim Reilly from Massachusetts, with over $1.7 million in career live tournament wins, wrote a long story via Twitter on June 3 Sunday about his backing agreement with Nick Palma, who has around $1.3 million live tournament earnings. His post had 3 phone screenshots, which he elaborately explained the issue via Notes. Reilly began by saying he had backed Palma "buying his action out of compassion" and that Palma himself approached him "as a human and needed help." Reilly said Palma needed to pay back five figures but it only continued to grow. He also claimed that Palma was also buying action of other players while also owing money to several other investors, including Reilly. However, Reilly did say that Palma paid him $5,000 but he still owes him a lot more. 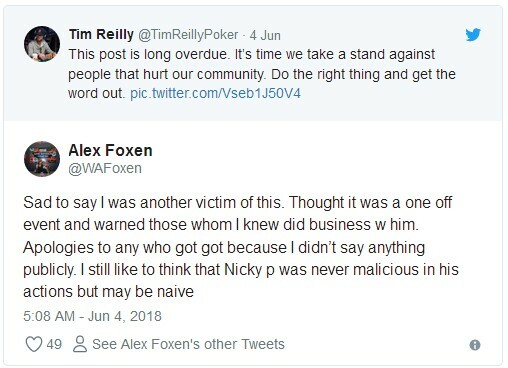 Alex Foxen, another poker pro who has made incredible cashes in the earlier part of 2018, quickly commented on Reilly's post by saying he too was a victim of the same stint. A little over a month after the Twitter shamefest, Tim Reilly shared that he was happy last Saturday after getting paid back by Nick Palma. 8 comments for "Nicky Palma pays back Tim Reilly after getting called out on Scamming Backers"
I do not know how this rule works to sponsor other players, but a paper should be signed before doing so, to be much safer. Unfortunately there are more players who have had problems with money recovery or did not want to pay the debts. A list of shame is needed to discourage these things. They should be paying the money no matter what. If you cant fulfill your side of the bargain, then dont make one. and they get deeper and deeper into the debt. From my point of view this happens in all countries to support another player and then divide the profits that are generated from it. I do not understand why some players choose to borrow from other players. If you lost the money you go home or borrow from casinos with proof that you have taken the money. When you pay the casino money with a small interest rate or not, there will have to be a method, that the player has a guarantee, that he has paid the debt back.